I wore this a couple weekends ago when my roommate and I went to our favorite restaurant for dinner - The Chowder Pot - SO tasty! It was a little chilly so going without tights wasn't the smartest idea, but I wanted to wear this dress without tights one more time. 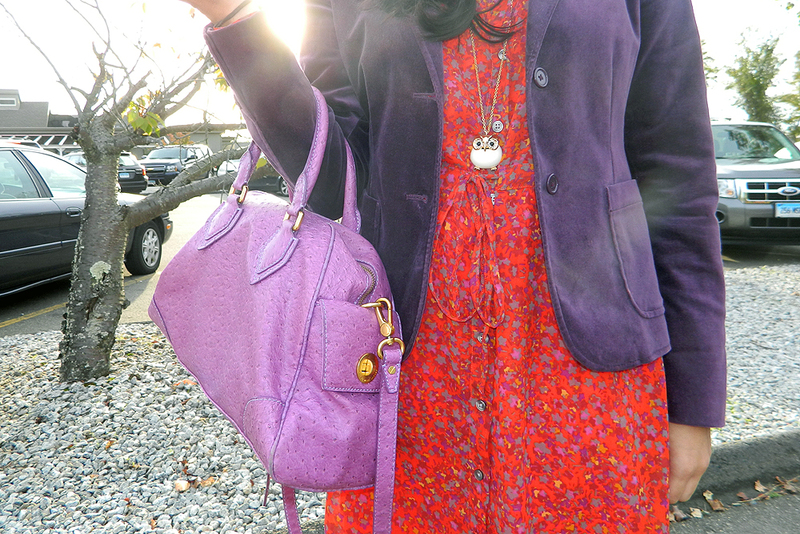 My bag perfectly picked up the light purple in the floral print of the dress, as did the blazer with the darker purple. I do love when that happens. I'm also wearing a new owl necklace my sister got me for my birthday, I have an owl obsession. I blame Harry Potter for amplifying the love. I love the purple blazer with the dress...and really miss the Chowder Pot! 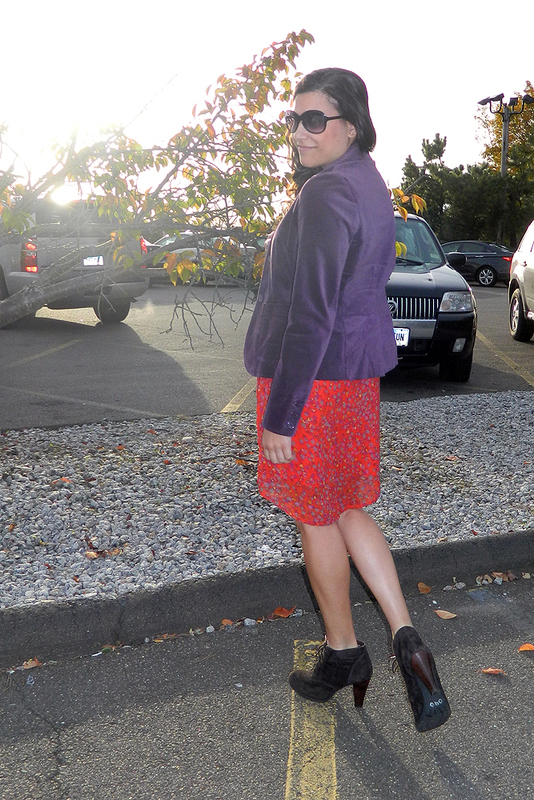 I really like the red and purple mix - and go without tights! Who needs em? 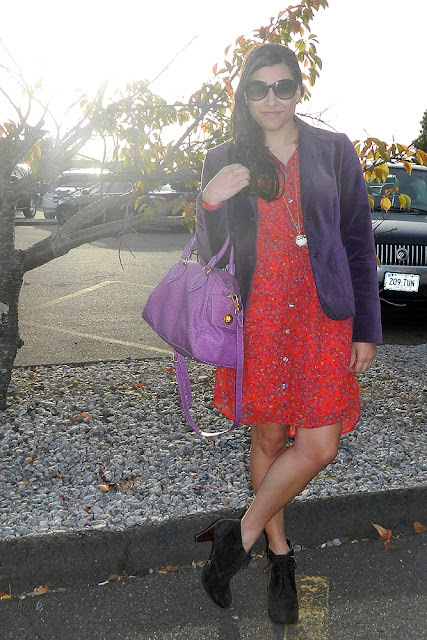 Nice dress - love it with the purple blazer - it really brings out the colors in the dress. Such a cute dress....I am avoiding tights like the plague...not ready for winter even if my feet freeze! Love this look! The blazer over the dress is just so pretty!! Oh look! It's the chubby little owl necklace! Love it! Love that dress, and its perfect with booties! Obsessed with the bag! I've got that same owl obsession. They're jut crazy cute! The jacket is my favourite piece, what a stunning colour! Love the purple and red together and the different tones of purple. Very daring in a good way. Excellent work with such high-contrast colors! Great outfit! I love your boots. Oh my gosh I love these colors together! That red looks great on you! Amazing styling my dear! Totally cute ! Love those colors ! 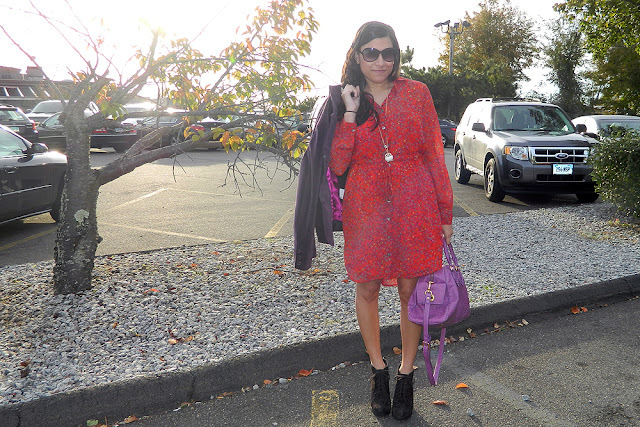 Love your printed dress! Great blog, would you like to follow each other? What a pretty dress. That jacket goes well with it. Yum! Chowder sounds yummy. I always have loved owls and Harry Potter sure didn't help! I love your red dress... I think you can't have too many red dresses actually! I am following you darling!! hope you'll follow me back!! Omg I LOVE that purse!!! And, I must say...purple and red is one of my fave color combos! I love this look! The red/purple combo works so well here.